Under pressure from wind developers and investor-owned utilities around the region, the Bonneville Power Administration this week backed away from a plan to start pulling the plug on wind turbines when it has too much water and wind energy at the same time. BPA Administrator Steve Wright is still reviewing a controversial plan to occasionally "curtail" wind farms in the region, a move the federal power-marketing agency has said is necessary to maintain grid reliability, protect migrating salmon and avoid passing big costs onto its public utility customers. Wind developers and utilities who buy their output say such shutdowns are discriminatory, will breach transmission agreements and compromise wind-farm economics because the projects rely on lucrative production tax credits and the sale of renewable energy credits that are generated only when turbine blades are spinning. They also maintain the plan is simply unnecessary, a sop to public utility customers that can be solved by other means. 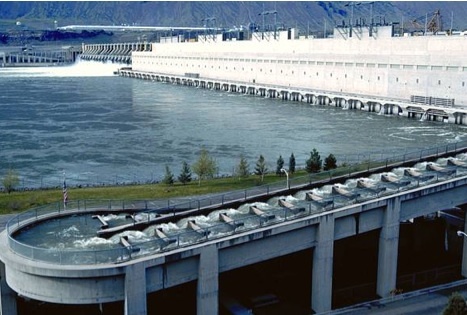 In one sense, the debate is simply the latest wrinkle in the perennial debate over who should bear the costs and benefits of operating the federal hydroelectric dams and transmission system. But it illustrates the growing complexity of integrating into the grid intermittent sources of renewable energy. "This is going to be a major issue for the region," said John Saven, chief executive of the Northwest Requirements Utilities, a trade group representing 50 public utilities that buy their power from the BPA. "We're in the first inning." The capacity of wind farms connected to the BPA's transmission network has ballooned from 250 megawatts in 2005 to more than 3,500 today and is expected to double again in the next two years. That outstrips demand growth in the region and is being driven in large part by California utilities, which are required to meet a third of their customers' electricity needs with renewables by 2020. Oregon and Washington have their own mandates, but more than half the wind power generated in the Northwest is sold under long-term contact to California. Congested transmission often means the only things exported are the associated renewable energy certificates that buyers use to comply with state mandates. The electricity often stays in the region, dumped into this region's wholesale market, depressing prices for electricity from all sources. The BPA, which operates 75 percent of the high-voltage transmission grid in the region, is responsible for balancing the minute-to-minute variations in supply and demand on the grid. The agency says growing wind capacity requires it to reserve more of its hydro generation as backup reserves, either to fill in for scheduled electricity when the wind isn't blowing or back off hydro production when wind-farm output is higher than scheduled. The BPA charges wind farms for that flexibility. But it says there's only so much it can absorb before those reserves start to compromise regular operations. Overgeneration typically occurs in the spring and early summer, when snow runoff and heavy rains combine to increase hydro generation and the same storm fronts rapidly ramp wind turbines. The BPA says the dam operators have only limited flexibility to dial back hydro generation to accommodate wind surges because dumping water through the dams' spillways raises dissolved nitrogen levels in the river, which can harm migrating fish. The result, BPA officials say, is that the agency is left with more power than regional customers need or that an already congested transmission system can ship out of the region. "Eventually, you just run out of places to put it," said Doug Johnson, a BPA spokesman. The BPA has worked during the past two years -- some say been pushed and dragged -- to accommodate more wind by improving forecasting and transmission scheduling. Adding transmission or new storage is a potential solution, as is transferring the responsibility for balancing some of the variable supply and demand to other utilities. But those are expensive, long-term fixes. Meanwhile, new wind farms keep mushrooming on the Columbia Plateau, exacerbating the problem. Last June, high wind and water nearly forced the BPA into "negative pricing," when it is forced to pay utilities and independent power producers in the region to shut down their plants and take BPA power instead. That's expensive for wind farms, where the cost of curtailment is not just replacement power, but the loss of production tax credits and renewable energy tags they generate when operating. The BPA recently estimated the combined impact at $37 a megawatt hour. That's not a price the BPA or its public utility customers want to pay. Wind producers are the Johnnys-come-lately to the Northwest's energy scene. But they argue that any move to single them out and curtail their production is discriminatory and violates the equal-access provisions of the laws governing the federal transmission system. They have the support of Oregon's Rep. Earl Blumenauer and Sen. Jeff Merkley, two Democrats who have criticized the agency in the past for dragging its feet on wind issues. The BPA has backed away from formally implementing the wind-curtailment plan, a move that renewables advocates applauded. But it hasn't come up with an alternative.